I always find it interesting to see runway interpretations of head coverings, whether or not they are 100% suitable for hijab. 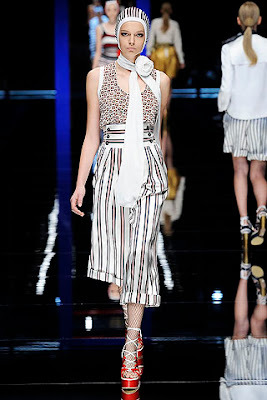 In the Fall 2008 collections, D&G featured headscarves on several of their models. 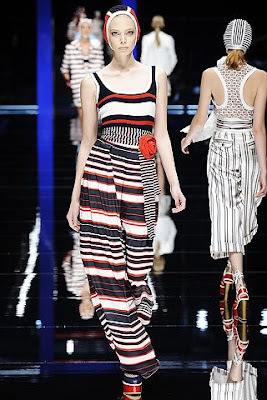 This season the French Riviera pervaded the collection, and models paraded in swim hats not dissimilar to the bonnet caps often worn under hijabs. 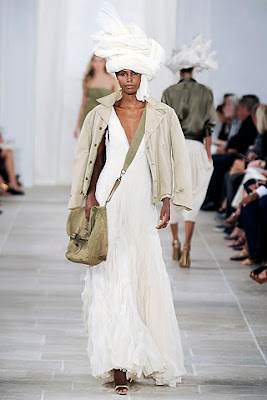 Ralph Lauren showcased turbans on several models, inspired by a North African colonial style. In addition to headcoverings, there were also maxi skirts and dress on offer, complete with long sleeved jackets. In a similar vein, but with a more authentic feel, Paul Smith's collection for women was inspired by an exhibit of British Orientalist art at Tate Britain. I loved the striped scarves that were loosely draped over turbans - definitely something you could easily adapt for hijab! 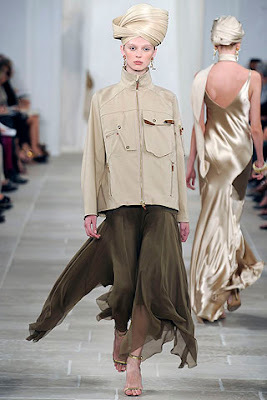 oo some very chic looks...i like the simplicity of the ralph lauren outfits.